Burton moved off the bottom of the Championship table with victory over fellow strugglers Barnsley. The Reds, under new boss Jose Morais for the first time, fell behind inside the first minute when Jamie Allen hammered a powerful shot into the top corner from outside the penalty area. Jacob Davenport's terrific free-kick made it 2-0 just before the interval. Kieffer Moore gave the hosts hope when he touched in Dani Pinillos' shot to pull a goal back, but Burton held on. 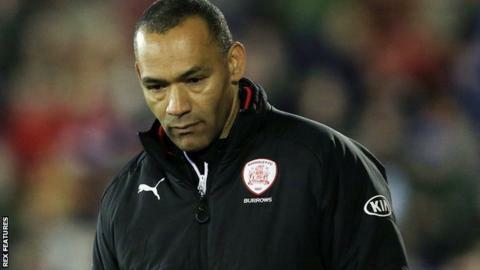 The Tykes, without a win since 1 January, thought they had grabbed a dramatic last-minute equaliser only for Mamadou Thiam's effort to be ruled out for offside. A comeback had looked highly improbable when Man City loanee Davenport scored his first league goal in the final minute of the first half to complement Allen's fine strike after just 57 seconds. However, Morais will have been encouraged by his side's second half showing with Tom Naylor clearing Oli McBurnie's shot off the line brilliantly and Gary Gardner forcing a fine save from Brewers goalkeeper Stephen Bywater before Pinillos scored. The Portuguese takes his new side to Birmingham on Saturday while Burton, who are now one point above the Tykes, host Millwall. "It was a very good performance in the second half and I really believe that we're in a good direction and we will achieve what we want. "There are players with quality enough to change the situation that we are in. "The less good thing was that we conceded two goals in the first half. We gave space to the opponents and we weren't effective enough to have control and create chances in the first half." "We deserved it tonight, especially with the first-half performance. We are absolutely delighted with the result. "It was a game of two halves. We knew there would be a response in the second half and 45 minutes was a long time hanging in there. "It was total bombardment, but thankfully we got the three points. "Perhaps they were a little shocked at how well we played in the first 15 minutes. That's as good as we've played for a long, long time." Match ends, Barnsley 1, Burton Albion 2. Second Half ends, Barnsley 1, Burton Albion 2. Offside, Barnsley. Brad Potts tries a through ball, but Gary Gardner is caught offside. Attempt blocked. Kieffer Moore (Barnsley) right footed shot from the centre of the box is blocked. Attempt blocked. Oliver McBurnie (Barnsley) right footed shot from the centre of the box is blocked. Assisted by Joe Williams. Corner, Barnsley. Conceded by Lucas Akins. Attempt missed. Brad Potts (Barnsley) right footed shot from outside the box misses to the right. Attempt missed. Mamadou Thiam (Barnsley) right footed shot from the centre of the box is high and wide to the right. Assisted by Matt Mills with a headed pass. Attempt missed. Daniel Pinillos (Barnsley) left footed shot from outside the box misses to the right following a set piece situation. Substitution, Burton Albion. Luke Varney replaces Jamie Allen. Jamie Allen (Burton Albion) is shown the yellow card for a bad foul. Substitution, Burton Albion. Jake Buxton replaces Joe Sbarra. Delay in match Jacob Davenport (Burton Albion) because of an injury. Goal! Barnsley 1, Burton Albion 2. Daniel Pinillos (Barnsley) left footed shot from outside the box to the bottom right corner. Oliver McBurnie (Barnsley) wins a free kick on the left wing. Attempt missed. Matt Mills (Barnsley) header from very close range is just a bit too high following a corner. Oliver McBurnie (Barnsley) hits the bar with a header from the left side of the six yard box. Assisted by Mamadou Thiam with a cross following a corner. Corner, Barnsley. Conceded by Jamie Allen. Attempt blocked. Joe Williams (Barnsley) right footed shot from outside the box is blocked. Substitution, Barnsley. Kieffer Moore replaces Tom Bradshaw. Corner, Barnsley. Conceded by Kyle McFadzean. Attempt blocked. Gary Gardner (Barnsley) right footed shot from outside the box is blocked. Assisted by Tom Bradshaw. Substitution, Burton Albion. Darren Bent replaces Liam Boyce. Attempt missed. Mamadou Thiam (Barnsley) left footed shot from outside the box misses to the left. Assisted by Andy Yiadom. Attempt missed. Joe Williams (Barnsley) right footed shot from outside the box is high and wide to the right. Assisted by Oliver McBurnie. Attempt blocked. Oliver McBurnie (Barnsley) right footed shot from outside the box is blocked. Attempt saved. Gary Gardner (Barnsley) right footed shot from outside the box is saved in the bottom left corner. Foul by Brad Potts (Barnsley). Foul by Matt Mills (Barnsley).